High School Couple’s Big Fat Wedding at Mangalya Vatika, Sola Bhagwat, Ahmedabad! Sahil and Krina’s story dates way back to 9th grade. This high school romance had the two juvenile lovebirds going steady right from sitting next to each other at tuitions to our man proposing in their very first year of college and now, to finally tying the knot 6 years down the line. This ideal couple decided to make it official at Mangalya Vatika, Sola Bhagwat, Ahmedabad with all the pomp and splendour that an Indian wedding entails. The festivities were kick-started with a ceremonial mehndi and haldi session followed was a fun-filled sangeet night where she stunned us all in an orange saree-lehenga with gold work by J. Kamdar, Rajkot along with a beautiful statement paasa. With all the glitz and glam we witnessed, thanks to the moments captured by the team at Preach Art, we’d say the event was certainly Bollywood-movie-worthy. The wedding itself was no less splendid, with the bride and groom wearing colour co-ordinated outfits that complimented not only each other but also the wedding décor! 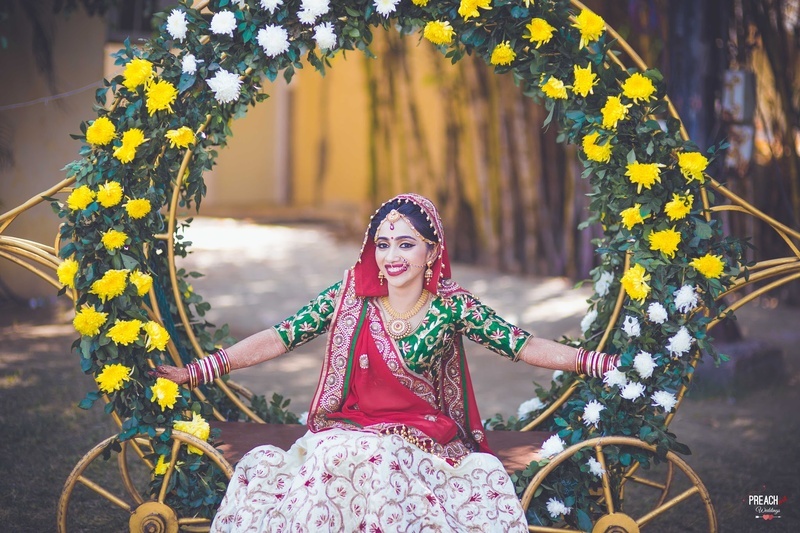 What to look out for: the beautiful, floral mandap décor, Krina’s cream, red and forest green lehenga with gold embellishment and the flawless make-up by Orange Salon that complimented her outfit more than perfectly. Sahil and Krina’s wedding started off with a Mehndi ceremony at Kasba hall, Alpha One mall, Ahmedabad, with all her loved ones present. The event was quite an enjoyable one; As Krina got her hands done up in intricate red-black swirls, she opted to wear an equally pretty sunflower-yellow and green brocade lehenga by Jay, accessorizing in a matching maang tikka and baju bandh. A gold statement completed her look beautifully. What followed was a Haldi session with her friends and family joyously applying the yellow paste in liberal amounts. Krina was captured in a turquoise blue, purple and yellow lehenga, having just as much fun with it, while Sahil sported a rust orange and navy blue kurta set by Asopalav. The wedding celebrations ensued and the couple found themselves dancing and singing at a fun-filled Sangeet night packed with tons of entertainment at Morli Farm, near Sindhu Bhavan, Ahmedabad. They even had a legit stage where the bride, groom and other guests had a blast performing several numbers! Krina even took to the stage for a special number, looking absolutely gorgeous in an orange lehenga with gold work by J. Kamdar, Rajkot with a gold statement paasa; while Sahil, who looked quite dapper himself, in a kurta-churidar set with a printed purple jacket by Kasheesh Anurag, couldn’t see to take his eyes off of her. Now, that’s what you call a Big Fat Indian wedding! The wedding day arrived and Krina entered the venue regally in a big chariot, beautifully decorated with flowers and leaves. She graced the event in a forest green, red and white lehenga with intricate gold embroidery by Jay, topping it off by accessorizing with minimal gold jewellery by Zinzuwadia jewellers. The flawless make up done by Aanal Patel at Orange Salon only accentuated her stunning bridal look. The groom entered on a white horse with all of the baraat, wearing a cream and maroon sherwani with gold tints by Asopalav along with a matching maroon safa and looking every bit wedding-worthy. What’s more is that not only were the bride and groom’s outfits co-ordinated but so were the decorations! The mandap was beautifully done up in green and white flowers and leaves, adding a contemporary touch to tradition. The couple then had their saat pheres and varmala ceremony and soon enough, it was time for the vidai, where naturally the beautiful bride shed a few tears. Kudos to the photographers at Preach Art for capturing all the lovely emotional moments beautifully!